Experimentalism seems to be a prominent theme in today’s techno scene, with artists all over the world consistently pushing the boundaries as to what can be defined as techno. The newest addition to Steadfast Records comes as no exception. 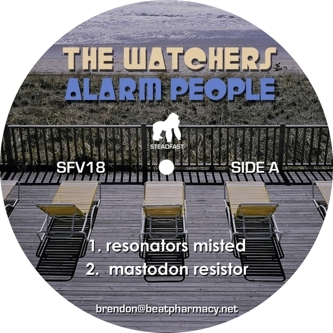 A team effort by well-known producers Speedy J and label boss Brendon Moeller working here under the creepy moniker The Watchers, “Alarm People” is four tracks comprised of flowing subbass, disjointed kick rhythms, and bubbling sound design that seems ready to overflow at any moment. The record apparently came about through a series of jam sessions inspired by a mutual love of both Krautrock and Techno - an influence that is easy to spot with the record’s emphasis on spaced out, psychedelic experimentalism. However, this is not to say that the record is made purely for laying in dens with tapestries and candles smoking hookah – this is still certainly a techno record and when used properly could surely result in some very interesting moments on the dance floor. The first track, “Resonators Misted”, contains some of the heavy dub atmospheres both Moeller and Speedy J are known for – washes of noise, sparse but driving hats, and deep, throbbing bass. The track gathers an assortment of electronic gurgles as it evolves into a swampy groove that is both enticing and strange. This formula is further explored on “Mastodon Resistor” which echoes some of the mangled kick rhythms of artists like 2562 while still undeniably establishing its own aesthetic and mood. A bizarre, slightly atonal sample breathes and trembles under the weight of heavy bass, surging up from time to time to grasp for air. While it is one of the more minimalistic tracks on the record it certainly stands out as one of the most unique. “Restart Moodiness” begins in a much more straightforward fashion with a simple four-to-the-floor kick and stereo hi-hat patterns, but soon diverges into much more as the listener gets enveloped in a barrage of noise and shifting tones that could make anyone question their sanity. The EP closes with “Astronomised”, a beatless voyage of chugging bass tones, choppy synths, and distant screams that sees Moeller and Speedy J at the height of their experiments. When one takes into account these kinds of sounds on top of the name of the project and the odd artwork, it seems as though there is a bizarre sexuality to these tracks. They come off as eerie and almost crazed, and would undoubtedly fit perfectly in any stalker’s tape deck. This being said, “Alarm People” is an inspired piece of work with a unique sense of sound design, rhythm, and structure. It showcases the talents of both producers while also bearing fruit to a very cohesive collaboration that shows a lot of promise looking forward. If you are indeed the type of person who chooses to engage in these outward sounds, a recommendation to pick up this release would not be ill advised. Review for CGNY by Nathan Levenson.